One of the best things about Twitter for me has not just been connecting online with all sorts of new theatrical buddies but actually taking the next step and meeting up with them to share our mutual passion for theatre. So when the ever-fragrant @pcchan1981 suggested a group trip to see Agatha Christie’s The Mousetrap for those who had not previously had the pleasure, six of us made our way to the St Martins Theatre for a Saturday matinée. 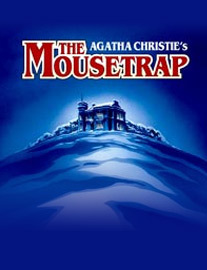 The statistics accompanying this show are frankly ridiculous: over 23,000 performances over 59 years which makes it the longest running show of any kind in the world, an all-the-more impressive scenario when one considers that it is a murder mystery that relies on the discretion of its viewers to not give away exactly whodunit – indeed, at the curtain call we are exhorted not to reveal the identity(s) of the guilty party(s). But is it a show worthy of its long-running status? Well yes, kind of. It is exactly how one might imagine a 1950s Christie murder mystery to be, very much a period piece with no concession to modernisation at all and all the stock characters and set-ups, chippy dialogue, red herrings and casual xenophobia that we have now become used to with the countless television adaptations of her works. Set in the Great Hall of new gust house Monkswell Manor, Mollie and Giles Ralston welcome five assorted guests, each with their own secrets natch, as a blizzard rages through the countryside, leaving them all snowed in together. As they hear about the news of the murder of a woman in London, a phone call from the police alerts them that they suspect the murderer is in the vicinity but are they too late…? It’s all rather stereotypically silly, but affectionately so with its complete lack of pretension and jolly hockey sticks approach from the cast. Gaye Brown is great fun as the hyper-critical Mrs Boyle, Ashley Cook is endlessly energetic as the hyper-active Christopher Wren, understudy Clive Marlowe made an intriguing non-specific foreigner as acute late arrival Mr Paravicini and Marcus Webb’s inquisitive DS Trotter stirs the pot nicely trying to get to the truth. As for the play itself, given its reputation it feels a little churlish to pass comment as basically it is what it is. Which is hardly the most sophisticated of stories: I have to say that I twigged the twist fairly early on, if not with all of the salient details (but then I’m a big fan of the genre) and a curious ending which feels weirdly hurried, dissipating the atmosphere that has been generated far too quickly and shifting the focus unexpectedly. At the same time, it was a highly entertaining afternoon which pretty much delivered what one would have expected from it with the added bonus of great company.